We're here for you and want you know what to expect from us. Preserving your data is very important. When we provide service for you, there is a possibility that all data stored on your device may be lost forever! This can include paid software registration keys, photos, passwords, music, and all other kinds of stored data. Sometimes we need to upgrade your device in a manner which may cause older applications you use to not function properly. Also, mechanical and electrical failure of your hard disk or other components inside your equipment can occur without warning. We are not responsible for any loss of data or functionality for any reason, which means making a backup of your data before we begin work and having your paid software codes on hand is your responsibility. We are happy to help you with this. You may request our backup services before we begin work on your device to ensure that your data is protected. We strive to provide our services with high quality, high efficiency, and customer service as our top priorities. We will make reasonable efforts to complete your work order within the estimated time of delivery, but do not guarantee that services will be completed within a specific period of time. We shall not be liable for any failures or delay in service due to any cause beyond our control. When your computer or phone isn’t working properly, it can be challenging and frustrating to figure out what exactly went wrong. This is why we believe in a reasonable amount of free diagnosis for your device. The first half hour of diagnostic service is free. Should we need additional time to give you a complete diagnosis, we will call you before incurring any charges. Our estimates represent our best educated guess, and are subject to change at any time. If we do need to make changes to our estimate, we will be in contact with you before we proceed. We have three service minimums: one hour minimum charge for house calls ($100), one half hour for in shop service ($50), one quarter hour minimum for phone consults ($25). For specific jobs, we may require a deposit up to the full estimated cost before we begin work. Once service is complete, payment in full is required before we can release your equipment back to you. Returned checks are subject to a $50 service charge. Also, make sure you take care of any outstanding bills from us within 30 days or you may be subject to late fees. We stand by our work. All labor is warrantied for thirty days with the exception of virus, spyware, adware and malware removal and liquid damaged equipment. There is NO warranty for removal of viruses, spyware, adware, or malware; if they are the cause of a resurfacing problem, you will be charged again for service. The effects of liquid damage to electronics can be insidious. Problems may crop up during repair or after service is complete that may or may not appear related to the original reported symptoms. Any device that is found to have any signs of internal liquid damage will be exempt from any warranties offered. We may still be able to complete the repair but, due to the nature of liquid damage and corrosion, we will not offer any warranty what so ever. We will cease work on your device and inform you as soon as we see any signs of internal liquid damage. Only after speaking with you will we continue with the repair. Products sold as New and/or Manufacturer Refurbished are warrantied by the manufacturer. 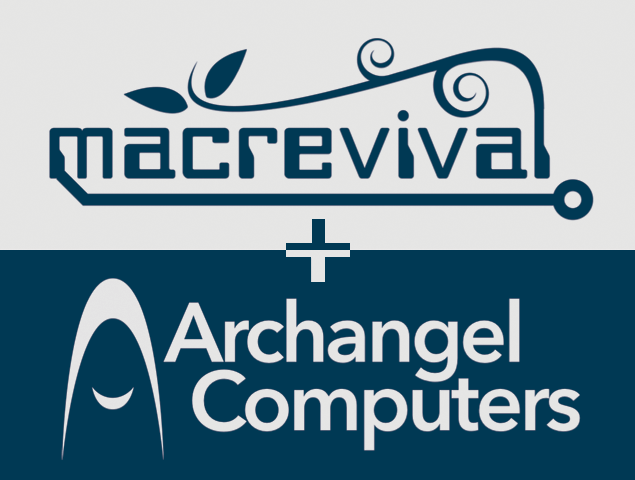 Products sold as Refurbished are warrantied by MacRevival + Archangel, LLC for 90 days unless otherwise noted. Products sold as Used are sold 'AS IS' unless otherwise noted. Shipping costs associated with warrantied merchandise are not covered by product warranties. Beyond the thirty-day labor warranty, any labor associated with manufacturer warranties (removal and installation) is your responsibility. We believe in being flexible. If you purchased something from us within the last 10 days and wish to return it for a refund, we will perform a quick inspection to make sure all the parts are still there and that nothing is damaged. If everything checks out, we may charge you a 15% restocking fee and refund at our discretion. Need to keep working while your device is in the shop for repairs? We may have a loaner device to help keep you productive while you wait for a diagnosis and repair. This service may have rental fees attached as well as specific rental terms and conditions. As a courtesy to you, we may backup your data on a shop-owned storage device before completing certain types of work. We secure erase this data after 2 weeks of storage in order to free up space for other jobs. Please make sure you have a personal backup before requesting service, as we are not responsible for lost or corrupted data of any kind. Looking to get rid of an old or broken device? We can responsibly recycle your unwanted devices. Your privacy is very important to us! Any data remaining on a device to be recycled will be securely erased for your protection. If we can’t wipe a storage device due to hardware failure, we will destroy it! Please do not abandon your device in our shop! If you haven’t claimed your device and paid all charges within thirty (30) days after being notified service is complete, your device becomes shop property! We make it a habit of attempting to contact you several times before considering your device abandoned. Please confirm your contact details when requesting service to ensure we can call you or send you an email with status updates. We are not responsible for inaccurate contact data! Any personal information stored on your device or viewed by our support specialists is considered confidential unless otherwise required by law. We believe in protecting your privacy at all times. You agree that you will be responsible for licenses for all software installed on your computer. As part of our service, we may recommend the acquisition of third party software. You agree that you will abide by all terms and conditions outlined within a license agreement whether this software is installed, recommended or sold to you by us or not. We may need to modify this information occasionally. Changes and updates to these terms of service can be viewed on our website, www.macrevival.com. You may also be notified of changes by email. New versions of our terms and conditions will never apply retroactively and we will provide you a current version of this document each time you hire us.